I know that I have only read two of her books (and technically, they were two parts of the same story, so it was really just one BIG book), but I’m going to have to say that I think S.D. Perry might have actually given Peter David a run for his money as being the author I would trust the most with my precious Star Trek characters. She’s definitely now among my top Trek authors, to be sure, after pulling off an amazing debut for the “eighth season” of Deep Space Nine with the conclusion of Avatar, Book Two of Two. I was highly impressed by both of these books, and not simply because of the various storylines taking place and intersecting and combining oh so beautifully. It was also how Perry handled each of these characters, both established and new, with a care and precision that in many ways surpassed the attention lavished upon them by the show’s writers. Most impressive was her handling of the character Ezri Dax. I had a huge problem with the fact that Ezri Dax was stationed to DS9 after Jadzia Dax was killed. It just felt wrong. But since it was going to happen regardless of what I thought, I decided that what I’d like most is to see a deeper exploration of the whole concept of being a Trill, especially for a host who never really planned on being a host. Needless to say, the show never really met my expectations in this regard. They only had one season to work with Ezri, so I guess they did as best as they could. Still, I wanted more. And Perry delivered in this book. She deftly explores the inner intricacies of what it’s like to carry around so many memories and lives in ways that provided amazing insight into both the Dax symbiont and the latest host to carry it within her. This alone made these two books enjoyable. Add onto this the fact that Perry also actually pulls off the reintroduction of Ro Laren to the Trek universe in a wonderful way (minus my complaint regarding the somewhat of a stretch in storyline from the first book). Indeed, there was a bit of an “encounter” between the TNG crew and DS9’s new chief of security, but only in regard to two brief interactions between Picard and Ro, which were contained and well-played. It is Jean-Luc Picard, after all. Plus, Perry gives us glimpses of the TNG crew interacting with DS9 crew in ways that I had always wanted to see during crossover episodes of the shows. There’s even a great scene in which Dr. Crusher is called upon to temporarily take over as DS9’s CMO. It’s a short snippet in the book, but it’s wonderfully executed and a delight to read. I think that’s a perfect summary for both of these books: They were a delight to read. I haven’t been this happy with a Trek book in a very long time. Avatar kicks off the continuation of the DS9 saga in high style. Perry shows Colonel Kira to be a competent and pragmatic commander of the station. She also takes Kira down a path that leads to quite a change for the normally spiritual Nerys. The end result is one that I have to admit left me with a profound sadness for Kira. Another sign of an excellent writer. I can only hope that the path that Colonel Kira now finds herself on is one that she is prepared to walk, but I can say this: I’m prepared to follow her, Lieutenant Ro, Dr. Bashir, Commander Dax, and all the others wherever their journeys take them next. I only hope that the next author responsible for continuing this story arc can live up to the high standards that S.D. Perry has now set. Final score: 5/5. The law of averages has demanded that I give this entire two-parter a solid 5. 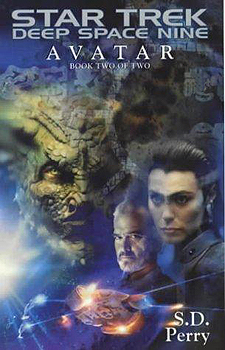 Highly enjoyable, and totally believable continuation of the DS9 saga. I can’t wait to read the next book!